generation device linked by hinged joints "Pelamis"
> The Pelamis Wave Energy Converter, or 'sea snake' is made up of a number of large floating cylinders. > As Pelamis moves up and down with the waves high-pressure oil is pumped through internal motors which drive electric generators. > Full size Pelamis devices are installed in the sea at EMEC, Orkney. Caption:　Wave direction. Oil is pumped through internal motors which drive electrical generators. Power is fed to the seabed via a single umbilical connected to a transformer in the nose of the device. ＊　Some of the best UK wave power locations are in Scotland. 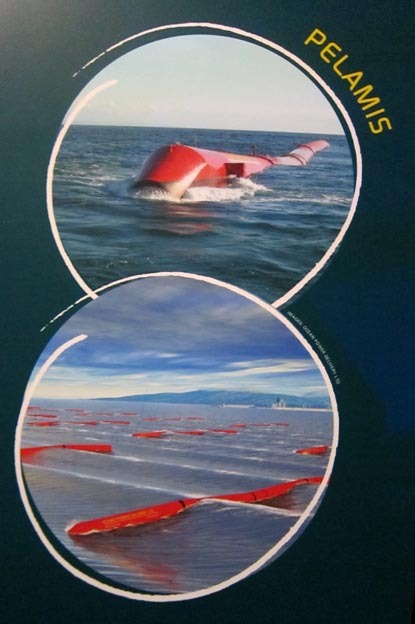 > Pelamis has a similar output to a modern wind turbine. > A installation of a square kilometer of ocean could provide electricity for 20,000 homes. 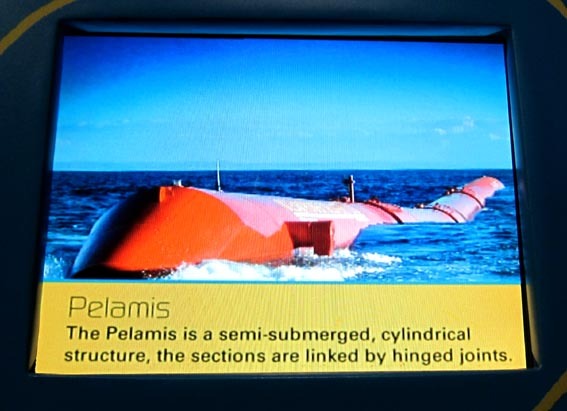 > The Pelamis is a semi-submerged, cylindrical structure, the sections are linked by hinged joints. 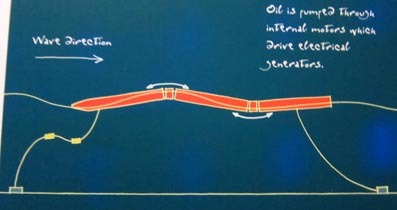 > The wave-induced motion is resisted by hydraulic rams, which pump oil through hydraulic motors. > The hydraulic motors drive electrical generators to produce electricity. 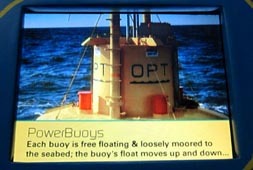 > PowerBuoys are intelligent systems capable of responding to differing wave conditions. 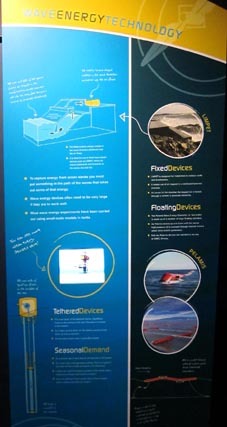 > ...data from Wave Buoy will be made available to wave energy developers. > The system is towed and moored to a suitable site in the ocean. > It is planned to construct and test a sea-going platform in Orkney, Scotland.